After a gig on Friday, Saturday was a night in with some Warhammer 40K and curry in anticipation for next week's Grand Tournament weekend. In spectacular Luke-Style, Luke hadn't even finalised an army and left with 3 unopened Tau Battlesuit boxes to frantically bolster his force with just 6 days to go! Between myself, Luke and James, we comfortably played 2 games within the time limit of 2 hours per game that we had set. James had his Dark Angels Ravenwing army as always, while Luke had minimised his troops in favour of more units focussed on killing things. Luckily for him, they rolled a Kill Point mission. Luke won the roll to go set up and deploy, forcing James to set up his Ravenwing and take the first turn. Following his recent Grand Tournament warm-up day with members of the FLAME ON! tournament team, James had some new ideas about playing his Ravenwing. Namely setting everything up (instead of outflanking) and swarming Luke's deployment zone on Turn 1. However, this was a Spearhead game, so James could only set up in his table quarter. Luke set up a lone Hammerhead in the opposite quarter and held the rest of his army in reserve with the Tau Battlesuits deepstriking in. What ensued was James's faster units hunting down the Tau, unit by unit, while the Tau took a steady toll on the Ravenwing bikes and landspeeders. Luke's two Tau Battlesuit command teams armed with plasma rifles, missile pods and Ballistic Skill 4 (hitting on 3+) were devastating, although the same couldn't be said of the Stealth Suits. 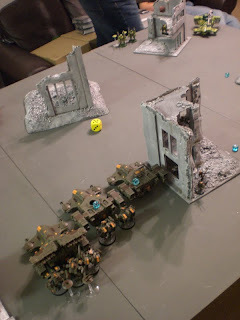 Luke has gone for a totally different approach to the Tau Empire in 5th edition 40K, which is to wipe out the enemy. He simply accepted that he will always struggle to claim or contest objectives. So his solution is to make things dead. And thinking about it, it's not a bad solution at all. The game ended with 5 Kill Points to James and 7 Kill Points to Luke. In between games we went across the road for a curry. 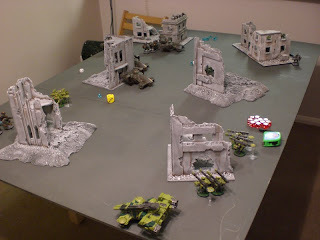 As James and Luke were driving, it was up to me to drink their complimentary brandys in the curry house, so I was a little more 'confident' in playing a hot Tau on Tau game against Luke. 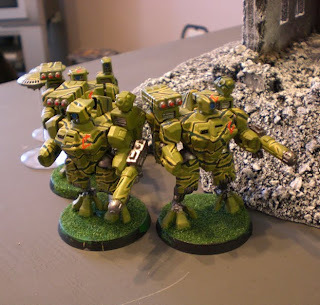 While my Tau army revolves around tanks and battlesuits, Luke's army revolves around battlesuits and broadsides. I didn't favour my chances against 5 railguns, 4 of which were twin linked. I also didn't fancy the chances of my Battlesuits against his 6 Fireknife battlesuits all hitting on 3+. We rolled the Annihilation Mission and Dawn of War set up. Usually my favourite combination, but then I realised I may have been better off in an objective grabbing mission. 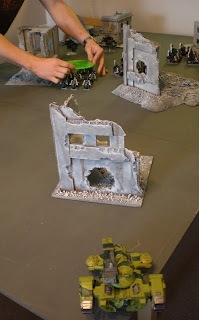 The game began with some sneaky setting up on both our parts with the plethora of smart missile systems on my tanks wiping out one of Luke's firewarrior teams. Luke's Stealth Suits deepstriked in front of my gunline and died horribly. Luke's second Tau Battlesuit Command Team deepstriked next to my Broadsides, but I had already disembarked 12 Firewarriors inside the nearby building. The Fireknife Battlesuits unleashed a volley of plasma fire and missiles at the Broadsides, but with some canny wound allocation, both Broadsides fought on with 1 wound remaining while only 1 shield drone was lost and they passed their moral check. Next turn 24 shots from the Firewarriors took a terrible toll before the Broadsides charged in and finished off the last Fireknife Battlesuit. Early in the game I passed an obscene number of 4+ disruption pod saves for my tanks. Surely testament to the power of alcohol consumption prior to a game? But as the game drew on, Luke's railguns began to take their toll. I simply didn't have anything that could take out so many Broadsides, let alone close with them quickly. Fortunately the game ended on Turn 5, otherwise my immobilised tanks would have quickly become destroyed tanks. 3 Kill Points to Luke, 4 Kill Points to me. We had some great games and a good curry. So not bad for a night in at all. Next weekend will be a good one. Out on Friday, play games all Saturday, out on the Saturday night, drag ourselves to the final day of the tournament on Sunday, then pack up and come home. Back to work on Monday! In the meantime, Luke has purchased 3 Tau Battlesuit boxes from me (they were just sitting in the cupboard) and will be amalgamating what points he has from his Stealth Suits and lone twin missile pod Battlesuit to see if he can make ANOTHER Fireknife Tau Battlesuit team from them. If he can kill enough, I think Luke might do quite well with his Tau army at this year's Grand Tournament. Curry, drinks and 40K. Sounds like a good weekend. I'm just about to start my Tau army for a tale of four gamers style thing that my mate is organising. 500 points a month for 4 months, while it doesn't sound like a lot, I'm a really really slow painter. More and more with Tau, I'm getting to the conclusion that 'Making It Dead' is a good idea. Majority Ld7-8 for the army means we often run like little schoolgirls when we take casualties. Considering how this Ld8 applies to costly Broadside and Crisis teams...yeah. There you go. Not so cool. The dead have yet to claim an objective, so kill 'em all certainly IS a policy. It's what I'm leaning towards, and why I favor the Fireknife. It just solves too many problems. Until we get some more reliable troops, I think slaughter is certainly the way to go for Tau. 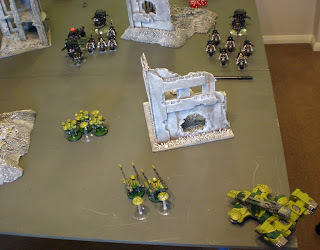 Do you think your mate, Luke, would mind you throwing his army list up for us to have a look? I'll put it up in a bit. BuT! its still nice to see and read the new games you played. Units already locked into close combat may not move during the movement phase." "... but are always allowed to move 6" in the assault phase..."
Hi! I have found this blog not many days ago, and it is great. As a tau player i'm loving the posts here. But in this one I have one doubt about how did you manage to allocate one wound in each Broadsice in a single unit firevolley. In the rulebook is stated clearly that multiple wounds to units have to fill a single miniature. So if you allocate enough wounds to BB to make two wounds, a single BB should have been removed and the other one left with 2 wounds. Except they have different configuration. Is one of them a shas'vre or leader? Looking forward to hearing how the Tau did at the GT. I notice from the results posted online that there was only one Tau player that qualified. I think that's me! I'd better go check. I left before the awards because my friend who was driving had been called in to work. They have a brief overview of the results posted on Warseer (tournament forum) but the actual results sheet hasn't been posted yet! How did you do you? Win/draws/loses? Looking forward to hearing your battle reports. I'm heading to heat 3 with my Tau. Similar mech list to yours, but with with an more hammerheads, kroot and stealths. I also read that the amount of 'ruin' terrain was pretty good, should help my army avoid those nasty biker armies a little better. Hey Adam, Saw your Tau army went quickly in your sale. I hope this doesn't mean the end of Warhammer Tau. Have you thrown in the towel and left the Tau'Va behind? Hope not, this is a great blog keep up the good work! I spoke about selling the army and starting over a few weeks back. So that's what I've decided to do. It just means that Warhammer Tau will get a new lease of life. Now that you are starting a new army is there anything different that you might do to it? different model choices, forgeworld only, new army colour etc??? and fingers crossed for the rumoured new codex that is supposedly to follow Blood Angels.